Friday, June 18: The resident Northern Mockingbird continues to reside at the corner of Mill and Russell (Fred Urie) and a very late Ring-necked Duck was seen today on Blue Heron Pond, East Riverside Park (Randy Horvath). Wednesday, June 16:Several of the staff at the nature centre are reporting their first chigger bites of the season. The best prevention for these irritating bites is to spray some insect repellant around your ankles and socks before walking into any grassy areas. Recent reports of late migrants include Black-throated Green Warbler and Golden-crowned Kinglet today at Ojibway (Fred Urie), Canvasback at Goose Bay Park on Tuesday (Matt Baker) and Red-breasted Nuthatch in Lasalle today (PD Pratt). On Sunday Eleanor Beagan and Jean Iron found an adult Laughing Gull in breeding plumage at the marina on the south side of Sturgeon Creek, near Point Pelee National Park. Then, at 4:00 p.m., at Wheatley Harbour, they saw a first summer Little Gull on the beach among many Bonaparte's Gulls. Also on Sunday at the Tip of Pelee, Alan Wormington saw a molting immature Mississippi Kite that flew around at the tip then went off up the east side. Saturday, June 12: The dragonfly outing today visited the creek in front of the Nature Centre, the pond boardwalk and the mouth of Turkey Creek. It was perfect weather for seeking odonates, hot and sunny, and 18 species were observed (Azure Bluet, Rainbow Bluet, Tule Bluet, Familiar Bluet, Fragile Fork-tail, Eastern Forktail, Common Green Darner, Common Baskettail, Prince Baskettail, Calico Pennant, Eastern Pondhawk, Blue Dasher, Dot-tailed Whiteface, Widow Skimmer, Common Whitetail, Twelve-spotted Skimmer, Black Saddlebags and Carolina Saddlebags). Carolina Saddlebags is a new record for Ojibway! Thursday, June 10: Fred Urie discovered a butterfly previously unkown at Ojibway when he found two Harvesters along one of the park trails today. The Harvester is peculiar because of its predatory habit as a caterpillar. 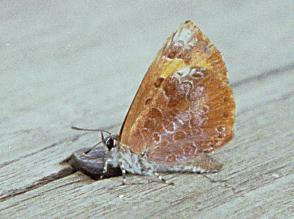 The larvae feed on woolly aphids, not plant tissue like other butterflies. 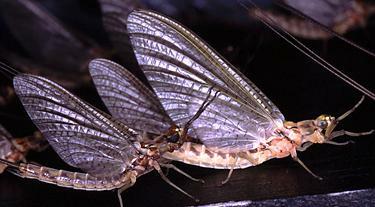 Millions of mayflies (Ephemeroptera) emerge along the Lake Erie and Lake St. Clair shorelines in mid June. In Windsor, the Lakeview Marina is a good place to observe the clouds of mayflies under lights each night. The return of these huge numbers are a sign of the improved condition of the Great Lakes in recent years. Mayflies at Lakeview Marina, June 1998 The adult mayflies are well known for their brief (ephemeral) adult lives, just a few days at most. They do not feed or drink during their short existance. They mate in swarms and the females return to the lakes to lay their eggs. The nymphs play an important ecological role as they feed on algae and in turn are eaten by fish. Monday, June 7: Two Blue-winged Warblers and a hybrid Brewster's Warbler have been present in the Spring Garden ANSI since May 29. A Yellow-breasted Chat, Acadian Flycather, Yellow-throated Vireo and White-eyed Vireo have also been recorded in Spring Garden over the past week. If you find a turtle wandering far from water at this time of year chances are it is female looking for a sunny spot to lay eggs. Male and female Painted Turtles can be separated by the length of their front claws. Males have much longer claws on their front legs than on their rear legs. Females have the same size nails on all four limbs. Click here for May sightings. You are on the City of Windsor World Wide Web Site.